We’ve been having some glorious flurries of snow here in the UK, which has been rather exciting for us all. A blanket of snow makes London look magical and the silent, crisp air entices you outside to enjoy what nature has to offer. Whilst it is bitterly cold, returning to the warmth after some jollities in the fresh air is a welcome respite and I for one like nothing more than getting stuck into some cooking and baking. Big A and Little Z set about baking some biscuits, in fact lots of biscuits – I’ll blog this recipe once I have completely perfected it for you. Eating some warming, comforting food is totally necessary in this weather and lentils are the perfect food to tuck into. The recipe today is great for the winter months, but can also be a fantastic dish in the spring and summer months eaten at room temperature and simply crumble the goats cheese instead of warming it. So if you are reading this in a hotter climate, fear not, you too can also cook the dish and be equally satisfied. The trick though with this ‘salad’ is in the timing. So if you are going to eat it warm please read the following. 1) A few hours before you intend to eat the salad place the tomatoes sliced in the oven and cover with caster sugar, salt and freshly ground black pepper. Put them on a low heat (100 degrees centigrade or less even) to gently slow roast away. 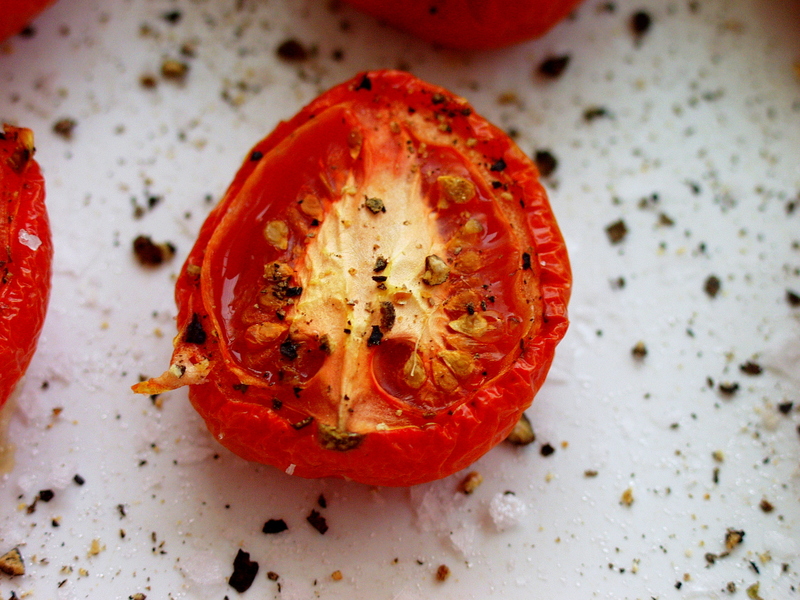 You want the tomatoes to shrivel up at the sides and the slow roasting will give them an incredible depth of flavour. Seriously off the charts kind of taste. 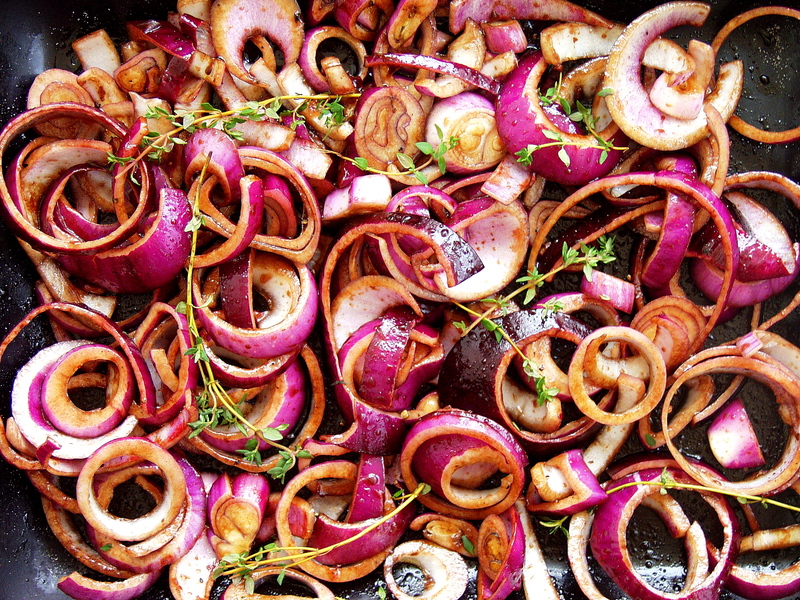 2) Place the sliced red onion rings on a baking tray covered in balsamic vinegar, caster sugar, olive oil, fresh thyme, salt and pepper and roast in the oven (180 degrees centigrade) for 25 minutes. If you do not have a separate oven to do this – as the tomatoes will need a lower heat – cook the onions first and then just heat them up in the low heat oven when the tomatoes are cooking to re-warm them. 3) Wash the lentils thoroughly then add cold water to cover them along with all the ingredients (listed below) and gently let them boil away for around 20 minutes. It is really important not to over cook them as they will become soft and soggy. You want to have them so that they still keep their shape. 4) Blend up the basil oil while the above is cooking away. 5) Plate up and whilst you are doing this place the goats cheese in a warm oven for a minute or two to warm it up then place on top of the lentils and drizzle with basil oil. Whilst the ingredients length looks rather long…..please do not be put off as it really takes no time at all – bar the slow roasting of the tomatoes, which need to be cooked slowly over time. Everything, except warming the goats cheese in the oven, can be done ahead of time and then simply warmed up for a few minutes in the oven prior to serving. 1) In the order of the above. 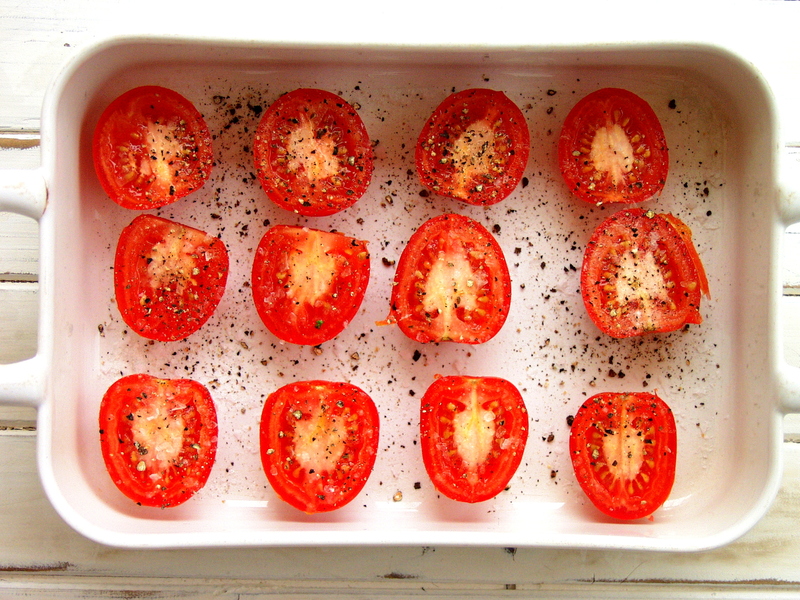 Place the halved tomatoes into an oven proof dish and scatter with caster sugar, salt and pepper and place in the oven at a low temperature – 100 degrees centigrade works well – for up to 2 hours. 2) Slice the onions into circles and scatter in a roasting tin along with the balsamic vinegar, caster sugar,olive oil, salt, pepper and thyme and mix together well with your hands. Place in an oven at 180 degrees centigrade for 25 minutes. 3) Wash the lentils and then cover with cold water. Add the carrot, red chilli, onion, garlic, ginger, fresh parsley, bay leaves, coriander stalks and bring to the boil and then gently simmer for 20 minutes (or what is advised on the packet). Be careful not to over cook the lentils. 5) Drain the lentils and remove the added ingredients as their job to flavour the lentils is now complete. 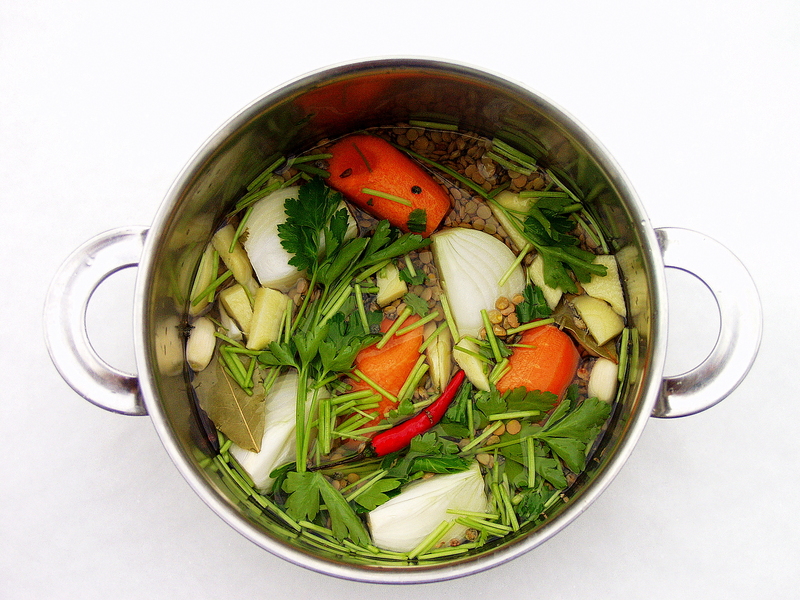 When the lentils are still hot add the tamari, sherry vinegar and sesame oil and mix together. 6) Slice the goats cheese and place on an oven proof dish and place in the oven for a minute or two. 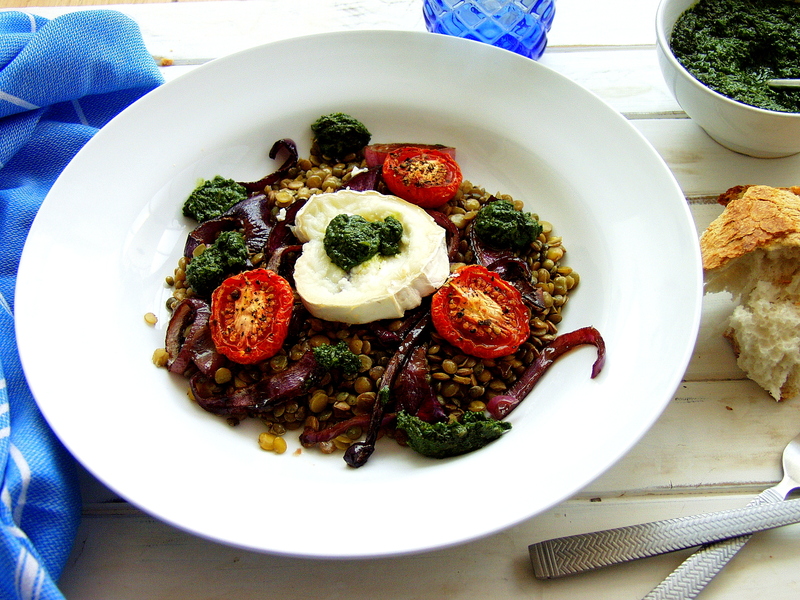 7) Plate up the lentils and add a generous helping of roasted onions, tomatoes and the goats cheese in the middle on the top with some dollops or drizzle of fresh basil oil and leave the rest in a separate bowl for guests to help themselves to more as they see fit. 8) Tuck in and enjoy along with some fresh bread on the side. It is absolutely heavenly. I know I often say that but seriously all the above effort is SO worth it. Aside from the roasting of the tomatoes, this dish took me 30 mins to cook and plate up. 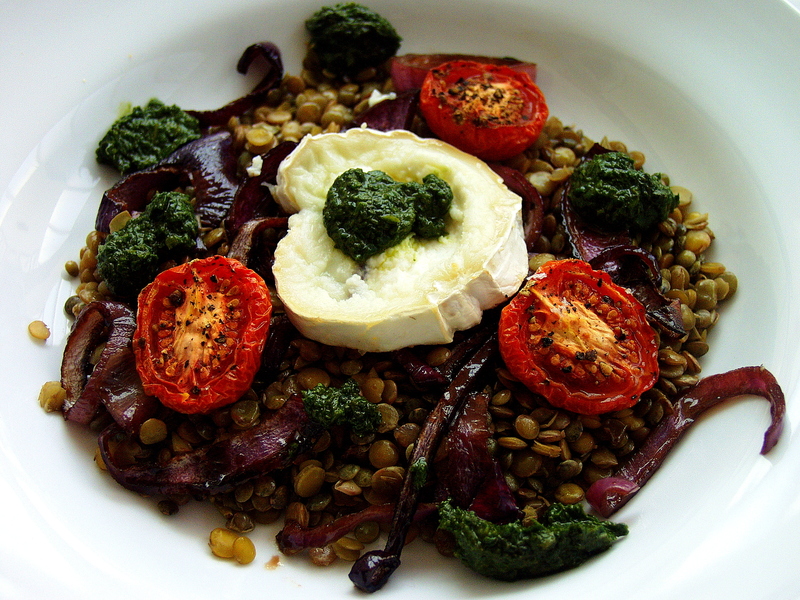 This entry was posted in Salad, Vegetable, Vegetarian and tagged a year in my kitchen, basil oil, goats cheese, green lentils, lentils, puy lentils, red onions, skye gyngell, tomatoes. Bookmark the permalink. Wonderful! !I lobve all these ingredients, ando so mixed together look amazing! !I’ll try!I’ll try!! p.s. I hope to see around, when the weather will be warmer…near tennis courts!! This salad looks so delicious!! And how I would love to visit London in the snow… maybe one day. Absolutely on my to prepare list.Thanks. This salad looks fantastic. (And I appreciate your detailed notes on the timing, too!) I’m in favor of anything that involves lentils and/or goat cheese! I like pulses generally and have already tried a variety of dishes. This one tempted me the minute I saw it on your site. I have not been disappointed. This lentil salad is delightful and has been appreciated by all the family! Lovely to hear. Big A absolutely adores it as well. Little Z is harder to convince but I’ll let her off the hook as she is only 3.